Also known as Lancaster Presbyterian Church, the Olde Presbyterian Church in Lancaster was built in 1862 and is the first brick church in Lancaster County. The congregation formed in 1835 and built its first church on this site shortly afterwards. When the current church replaced the original one nearly three decades later, hand-made brick was used to construct the Gothic Revival sanctuary. The church’s first pastor was the Reverend James Thornwell. Dr. Thornwell was a well-regarded theologian and seminary professor at Columbia Theological Seminary (now called the Robert Mills House) in Columbia. Dr. Thornwell was also at one time the president of South Carolina College – now the University of South Carolina – as well as the pastor of First Presbyterian Church in downtown Columbia near the former seminary. The Thornwell Home for Children in Clinton is named for him. Lancaster Presbyterian church outgrew this site by the early twentieth century and relocated to its current location on Main Street in 1926, leaving this church building vacant. Another church briefly occupied the building before the Masons used it as a meeting place, and in 1962 it ended up in the hands of Dr. Benjamin F. Emanuel, who converted the sacred space into the Carolina Museum. However, the former church was once again unoccupied by 1972. The Lancaster County Society for Historical Preservation purchased the building in 1976, and in 2012 it reopened as the Cultural Arts Center after an extensive restoration project. 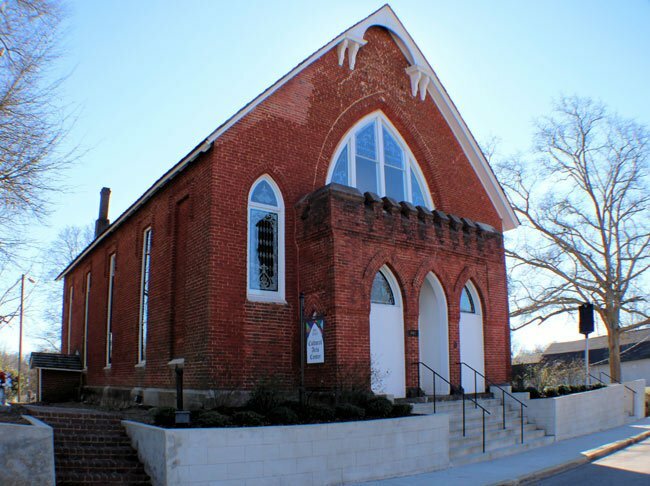 The Old Presbyterian Church is said to be acoustically ideal for concerts hosted by the Cultural Arts Center. (Old Presbyterian Church) Lancaster Presbyterian Church has played an integral part in this community’s history since the mid-1800s. Completed ca. 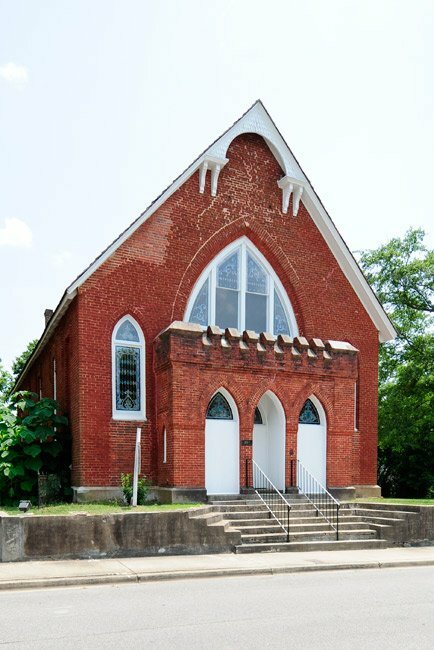 1862, the present church is thought to have been the first brick church in Lancaster County. The walls are of handmade brick. Basilican in plan, the church features a gallery along the sides and back of the sanctuary and culminates in an arched pulpit apse. The walls are stuccoed and scored to resemble stone. Interesting details include hood moldings over the arches, cornice brackets with pendants under the gallery, and round wooden columns supporting the gallery. The Lancasterville Presbyterian Church was organized in 1835, and in 1860 the congregation decided to erect a new church (the present structure) on the site of the original one. 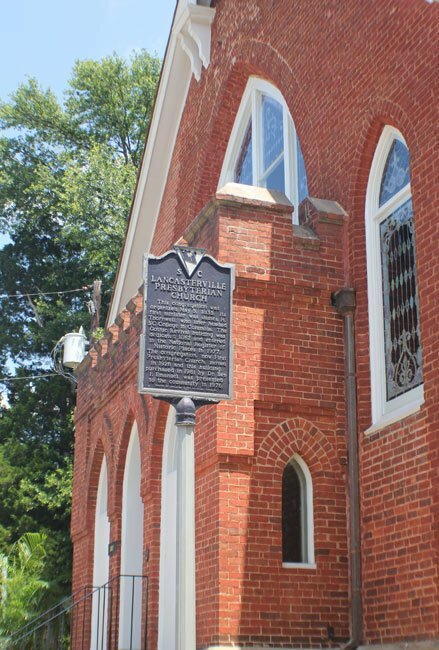 The contract was given to Sidney Retting of Charlotte, North Carolina, and the church was completed by January 1862. Designed in the Early Gothic Revival style, the church was dedicated on March 29, 1862. 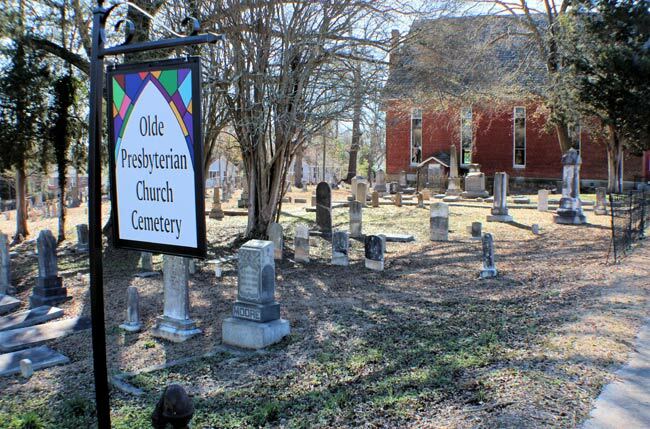 A cemetery dating from the 1830s is located to the left and rear of the church, and many of its graves are of Lancaster’s leading citizens. 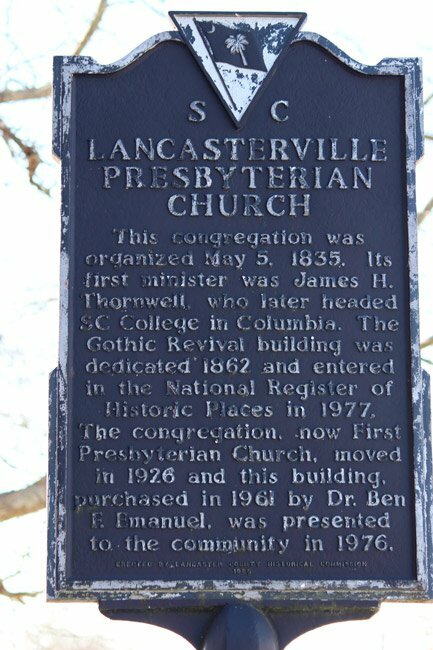 In 1926, the congregation moved to a new church on Main Street in Lancaster. The old structure was then used by another church and later by the Masons. In 1962 it was purchased by Dr. Benjamin F. Emanuel under whose direction it became the Carolina Museum. Unoccupied since 1972, the church was purchased in 1976 by the Lancaster County Society for Historical Preservation, Inc.